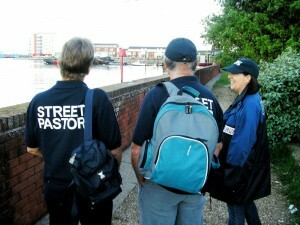 Street Pastors is a national organisation aiming to communicate with people on the streets to care, listen and help. Our teams carry first aid kits, water and flip flops for those whose shoes prove too much at the end of an evening! 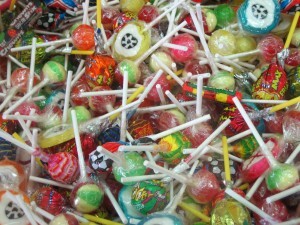 The young people in the Waterside have learned very quickly that the teams also carry sweets and lollipops. Street Pastors began in London in January 2003 led by Rev Les Isaac, and has seen some remarkable results including drops in crime in areas where teams have been working. There are now over 11,000 trained volunteers in around 250 teams around the United Kingdom plus new projects around the globe. Each city project is set up by Ascension Trust and run by a local coordinator with support from Ascension Trust, local churches and community groups in partnership with Police, Council and other organisations. 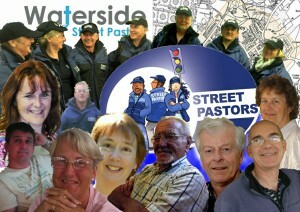 Waterside Street Pastors came into being in 2012 with eleven churches signing thelicence agreement and forming a management committee. The Official commissioning took place at Applemore School on 28th September 2012 and the first patrol went out on Friday 2nd November.We currently have around 25 trained Street Pastors who patrol the Waterside area between Marchwood and Calshot on alternate Friday and Saturday evenings.